Today was Day #10 of Chocolate and Caramel and Toffee Theme Weeks. 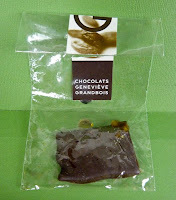 I've enjoyed chocolates during the past few weeks that have run the gamut between caramel and toffee. Sometimes a caramel was like a toffee, and a toffee was like a caramel. Both involved fusions of sugars and usually some fat or butter. 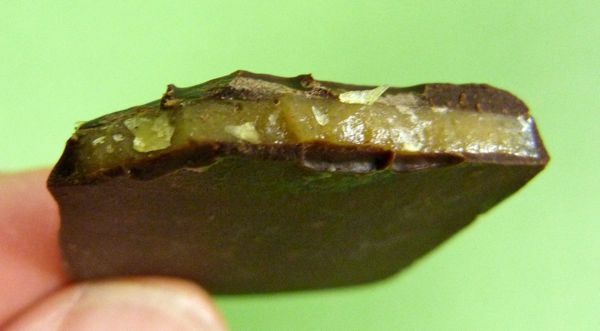 Caramel in the U.S. is often gooey, and toffee is often more like a crunchy brittle. Both can be made lovely by a dark chocolate covering and a little fleur de sel. And such was the case today. 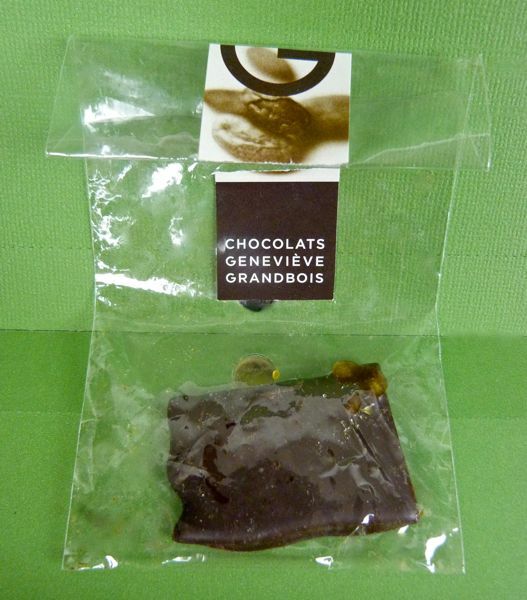 Today's thin, Caramel a la fleur de sel from Chocolats Genevieve Grandbois (Montreal, Quebec, Canada) was, despite the simple plastic bag enclosure, elegant, and also well balanced and satisfying. Not too sweet, not too salty. Just the right textures -- a crunchy caramel layer, a smooth, dark chocolate covering, with just a hint of crispness from a few, well placed, tiny shards of sea salt. Thank you to Sunita for bringing back this chocolate from Montreal to share.